There are so many wonderful combinations for Risotto, it is hard to choose which ones to make. I have included four here at the bug, on the grounds they are the ones I make most frequently. I could probably have listed ten, as I love the simple pleasure of standing over the stove tending my Risotto, ladle by ladle, until the unctuous loveliness is ready to eat. On which subject I am going to be controversial and suggest Risotto should be thick - not watery and like a half cooked porridge. 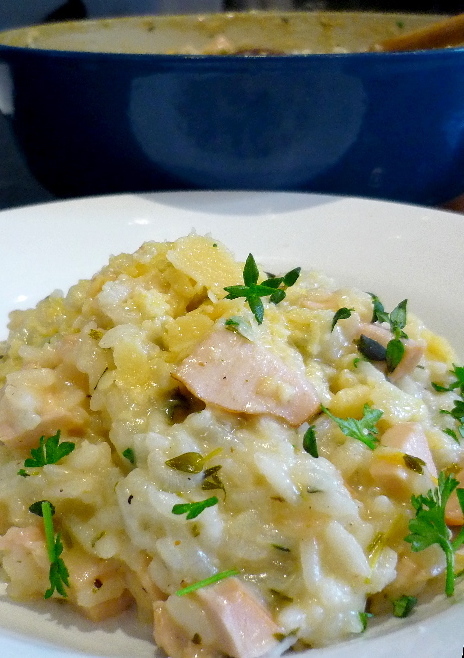 Smoked Chicken Risotto is an absolute favourite. The flavour is intense, yet subtle and the chicken is so tender, soft and juicy that it brings the whole dish together with its smoky goodness. 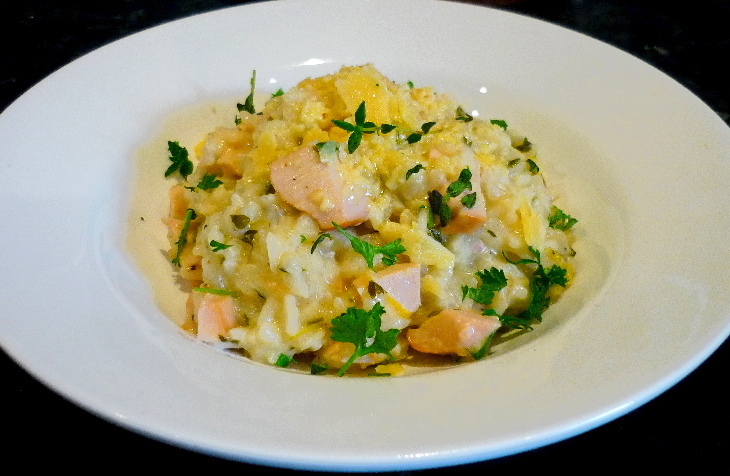 There are many ways of preparing risotto, yet once I tried smoked chicken, the plain chicken variety became obsolete! Add your favourite herbs, dress it up or down, it is a very satisfying dish to share with friends. Quantities here are for 4-6 people, or as a super left-over, Risotto is great the next day reheated. In a paella or risotto pan, melt butter over a medium heat. Add the bacon, nutmeg, then onions and allow to soften before adding the rice. Cook rice until it is translucent, then add the garlic and chicken pieces and a little stock. Add the mustard and the vinegar and stir through well – this gives the risotto a good boost of flavour and cuts back the creaminess a bit. Add the wine, allow it to bubble up then add more stock, stirring constantly. Reduce the heat, add the herbs and continue adding stock until the rice is fat and cooked through. Do not allow the Risotto to become too watery. It is difficult to give a volume for the chicken stock as some rice is thirstier than others, have 3 cups on hand, then if needed top up with hot water. Just before serving squeeze over the lemon juice and add the zest, mix through the parmesan cheese and a few sprigs of thyme. Allow the risotto to rest for a few minutes before serving with a little extra crumbled parmesan and a sprinkle of fresh herbs.